Rode our ATV's up to the top of the mountain today to check out the lookout tower. 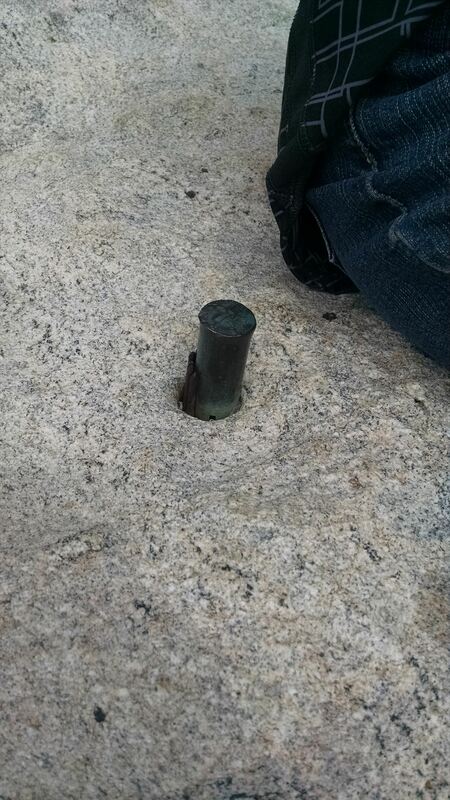 The Benchmark - the bolt drilled into the rock is there and is easy to find. See attached picture. There is a Reference Mark - which is a disc that has an arrow on it pointing towards the main mark - is located just a few feet away and is cemented into the top of a rock. See the 'bad' picture attached. This is a picture of the Benchmark "Bolt"
This is a picture of the reference mark that has an arrow on it that points towards the actual Benchmark. This is not the "Bolt"
I'm 90% sure I found this. I certianly resembles a bolt or rod drilled or driven into the stone. I wouldn't want to trip and fall on it! This was a sunny day at the top! Cool day, this Benchmark dated 1957. They year I was born. Found it at the lookout. Great spot! found it - at the top of the mtn. DESCRIBED BY US GEOLOGICAL SURVEY 1957 (OSR) STATION IS ABOUT 9 MILES SOUTH AND 6 MILES WEST OF DAYTON, IN BIG HORN NATIONAL FOREST AND ON SUMMIT OF BLACK MOUNTAIN AT THE SITE OF THE BLACK MOUNTAIN LOOKOUT. TO REACH FROM THE POST OFFICE IN DAYTON, GO SOUTHWESTERLY ON U.S. HIGHWAY 14 FOR 6.9 MILES TO A SIGN ON RIGHT ENTERING BIG HORN NATIONAL FOREST. CONTINUE ON HIGHWAY FOR 10.2 MILES TO A FOREST SERVICE ROAD LEFT AT A SIGN BLACK MOUNTAIN FIRE LOOKOUT 6. TURN LEFT AND FOLLOW WINDING, GRADED ROAD SOUTHERLY FOR 3.55 MILES TO A FORK AT A SIGN BLACK MOUNTAIN FIRE LOOKOUT 2. TAKE LEFT FORK, AS PER SIGN, AND GO SOUTHERLY FOR 0.1 MILE TO A T-INTERSECTION. TURN LEFT AND GO EASTERLY FOR 0.8 MILE TO END OF TRUCK TRAVEL AT A SIGN BLACK MOUNTAIN FIRE LOOKOUT 1 AND AZIMUTH MARK. PACK NORTHERLY ALONG GOOD FOOT TRAIL ABOUT 1 HOUR TO LOOKOUT CABIN AND STATION AT HIGHEST POINT. STATION MARK IS A COPPER BOLT SET IN A DRILL HOLE IN A 8 X 12 FOOT BOULDER. IT IS NOT STAMPED AND PROJECTS 2 INCHES. IT IS 6 FEET EAST OF THE SOUTHEAST CORNER OF THE CABIN. NO WHITE WITNESS POST WAS SET. REFERENCE MARK 1 IS A STANDARD DISK, STAMPED BLACK MTN USGS NO 1 1957 AND CEMENTED IN A DRILL HOLE IN A LARGE BOULDER. IT IS 23 FEET EAST-SOUTHEAST OF THE SOUTHEAST CORNER OF THE CABIN, 13 FEET SOUTHWEST OF THE CENTER OF A SMALL, CONCRETE WINDCHARGER FOUNDATION AND ABOUT 3 FEET BELOW STATION ELEVATION. 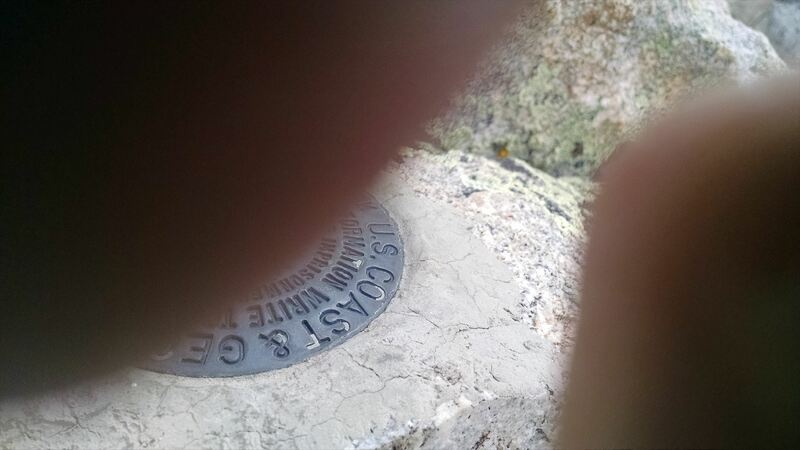 REFERENCE MARK 2 IS A STANDARD DISK, STAMPED BLACK MTN USGS NO 2 1957 AND CEMENTED IN A DRILL HOLE IN A LARGE BOULDER. IT IS 22 FEET EAST OF THE SOUTHEAST CORNER OF THE CABIN, 10 FEET SOUTHWEST OF THE CENTER OF THE FOUNDATION AND ABOUT 4 FEET BELOW STATION ELEVATION. 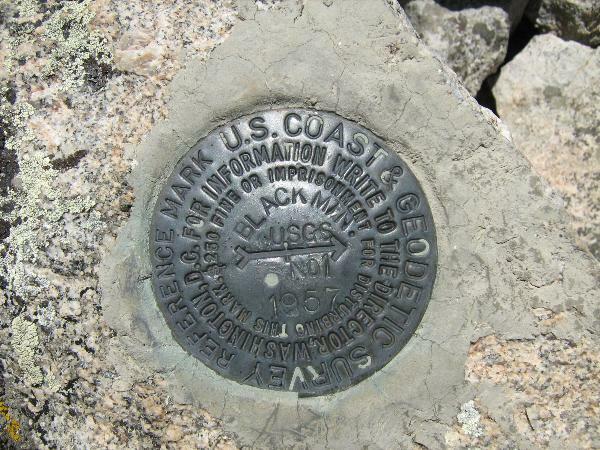 AZIMUTH MARK IS A STANDARD DISK, STAMPED BLACK MTN USGS 1957 AND CEMENTED IN A DRILL HOLE IN A 3 X 3 FOOT BOULDER WHICH PROJECTS 1 FOOT. IT IS 36 FEET NORTH OF THE CENTER OF A TRACK ROAD AND 17 FEET WEST OF A SIGNPOST BLACK MOUNTAIN FIRE LOOKOUT 2. A 4 IN X 4 IN WHITE WITNESS POST WAS SET 3 FEET WEST OF THE MARK. RECOVERY NOTE BY US GEOLOGICAL SURVEY 1964 STATION LOCATED ON A PROMINENT PEAK LOCALLY WELL KNOWN, 10 MI. SW. OF DAYTON. STATION WAS ORIGINALLY CALLED --APPENDIX-- BY USGS. STATION MARK--COPPER BOLT IN SOLID ROCK, WHICH PROJECTS 0.2 FT., NOT STAMPED. The horizontal coordinates were established by classical geodetic methods and adjusted by the National Geodetic Survey in January 1997.